I try to ‘create’ with my children regularly. Sometimes it comes naturally. Sometimes it is work to get motivated. I love to involve us in seasonal activities and often look to nature for inspiration. And so “Make it Monday” is born. I will be posting a seasonal craft activity each Monday to share with you. I would also love to hear what you have been working on through the week…so share away! It is winter. 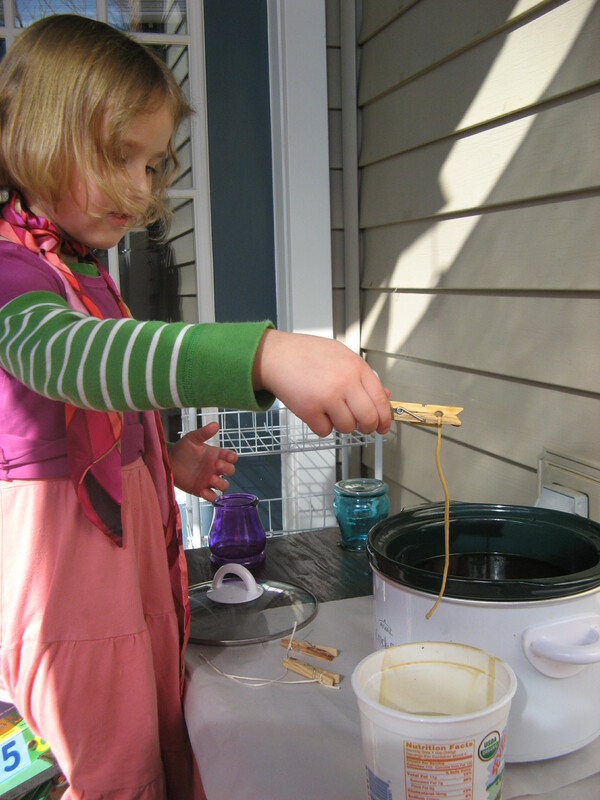 That means lots of beeswax projects in our house. I love that warm, sweet smell of melting beeswax. 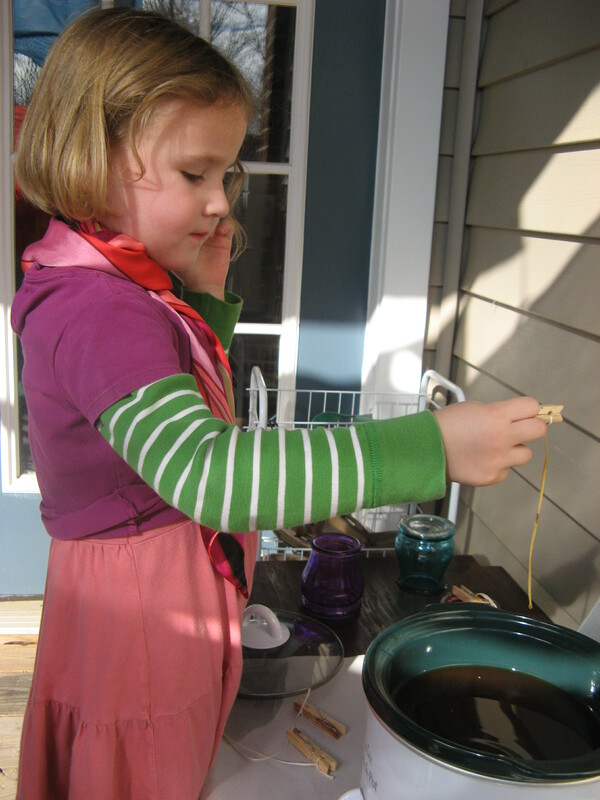 I try to think of the sensory element to projects I undertake with children. So often smell seems to be forgotten, but it is so powerful……just think how a fleeting smell can bring you right back to an experience from your childhood! I would love for the smell of beeswax to bring warm fuzzy feelings to my children. This is my second year of working with this material and already, when I brought out the wax at the beginning of the winter, memories from last winter came flooding back. We dip many things in wax. On our nature walks my daughter collects things to dip – autumn leaves, pine cones, feathers. But, we started with candle dipping, so that is what I will share with you today. * Beeswax – ask a honey seller at your local farmers market, that will be your cheapest and most local option. there are also many places online that will ship to you). * Heating device – a can, place in a pot of water on the stove works just fine – but you will need to remove it from the stove to use it and it will cool down fast. We use a crock pot, found from a local thrift store (there were plenty to choose from) and it seems to work well. It keeps the wax at a constant temperature. * Candle wick – we bought a spool of this from Michaels (using one of their frequent 40% off vouchers, bargain!) but you can also buy online. Make sure you get the correct thickness otherwise your candles will not burn well. We chose the thinnest, which stated it was suitable for candles up to 2″ thick (our candles never get bigger than that!). 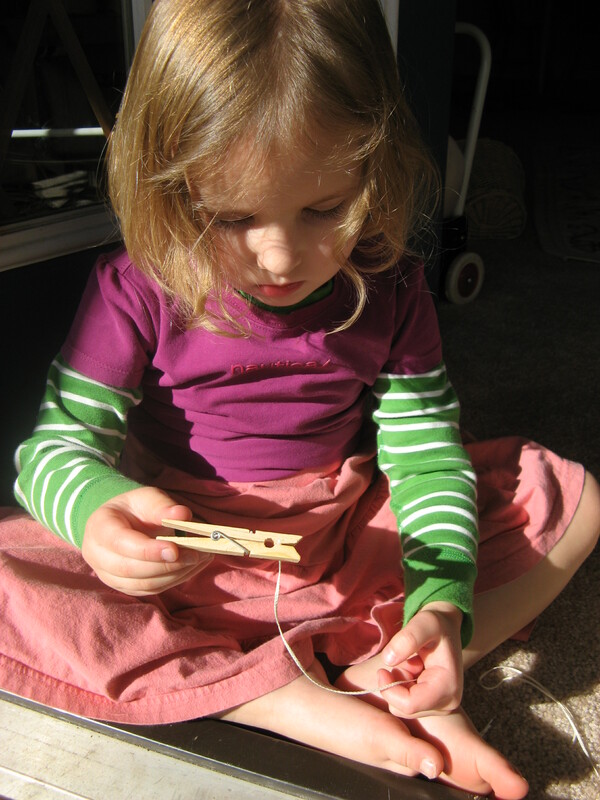 * Clothes pegs – anything will do as these are simply for holding on to the wick when dipping. You could also just tie the wick onto a stick which would be even cheaper, but more fiddly. * Pot of water – we used a large yogurt pot with cold water in but anything will do, as long as you don’t mind it getting wax on. Cover your work area in newspaper to protect everything from melted wax! Start melting the wax. Depending on how you bought it (a large block, pellets) etc the time for this may vary. My large block in the crock pot took a couple of hours! 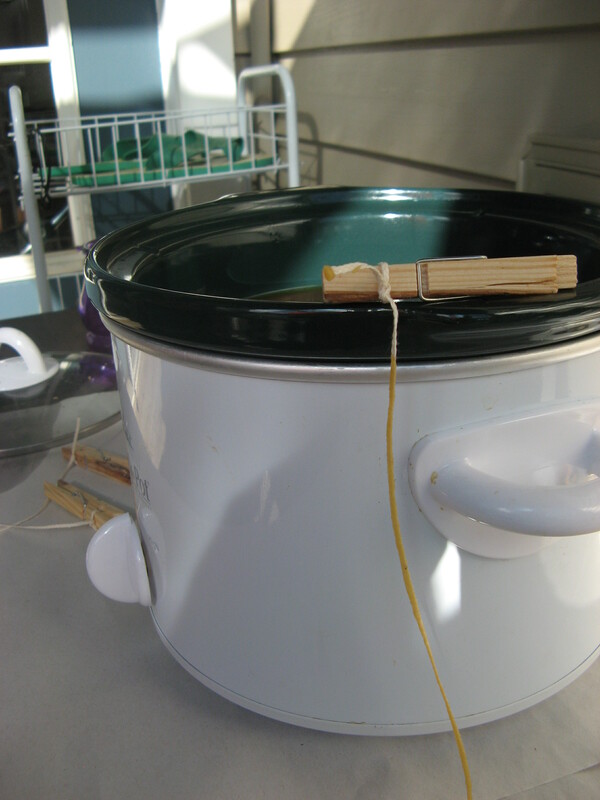 Cut a strip of candle wick so that it is the depth of the wax heater (crock pot etc) plus a couple of inches. Mine were cut to be about 12″ but this is not an exact science! Tie the wick to the end of the clothes peg (or stick), with the long end hanging down. Once the wax is hot, dip the wick as far as it will go, but stop before you reach the peg. A quick dip is best. When you take the wick out it will have a very thin layer of wax on it. Gently straighten the wick before it gets hard. Dip it into the pot of water to harden the wax thoroughly. 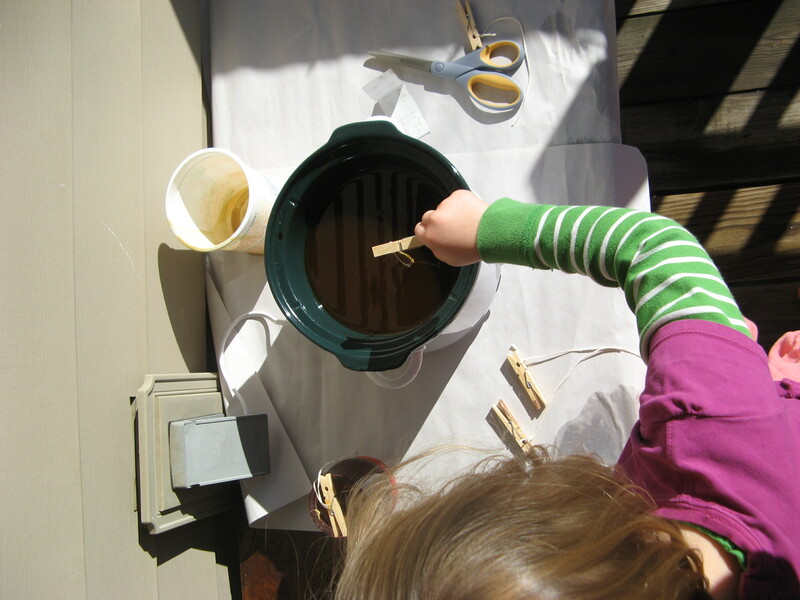 Alternate dipping between the hot wax and the water. Whilst the water isn’t actually necessary, I have learned that it is very useful when doing this activity with young children. You need to make sure the wax is fully hard before dipping again, otherwise the previous layer will simply melt and the candle will not grow! You can wait a few minutes between dips but for younger children this is hard. Dipping in the cold water encourages the wax to harden almost instantly – plus this way you get to dip in the wax AND the water! 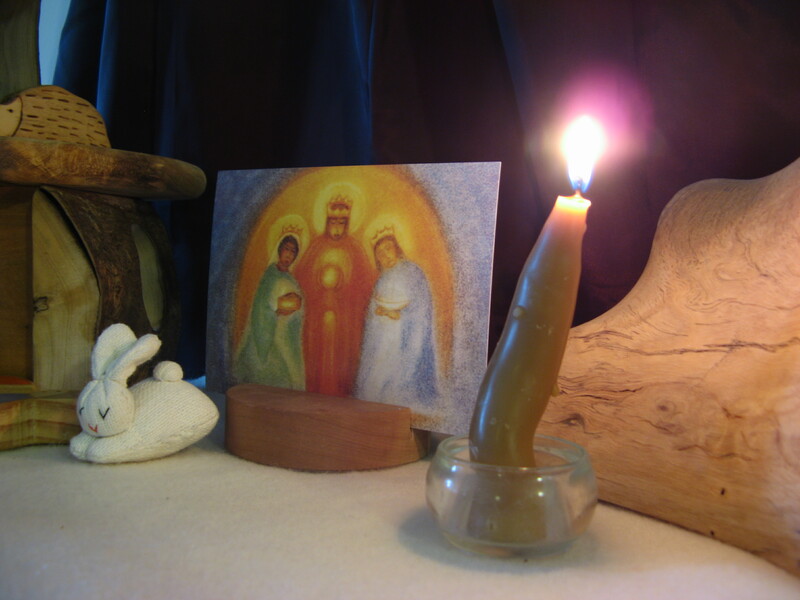 When you feel that your candle is finished (whatever thickness you desire) it is ready to be finished. You will notice that the bottom of the candle (the opposite end to the peg) has a bulge. You want to remove this so that your candle can stand straight. Take a sharp knife and cut the bottom off until you see the wick. 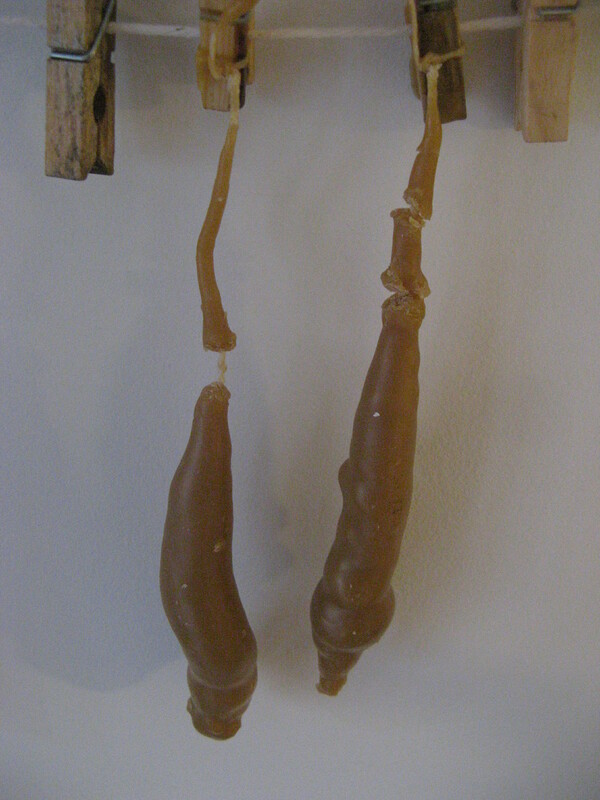 Now you can hang your candle up so that it hardens completely. How about adding some wax crayon to the melting wax to make colored candles. Warning – a little wax crayon goes a long way! 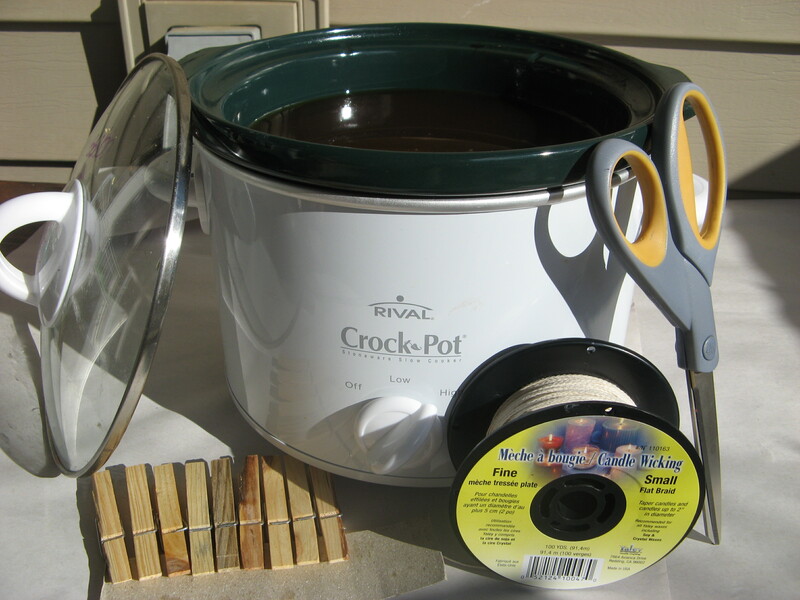 You can even melt a few cans of wax in different colors and layer the wax by dipping in alternate colors. 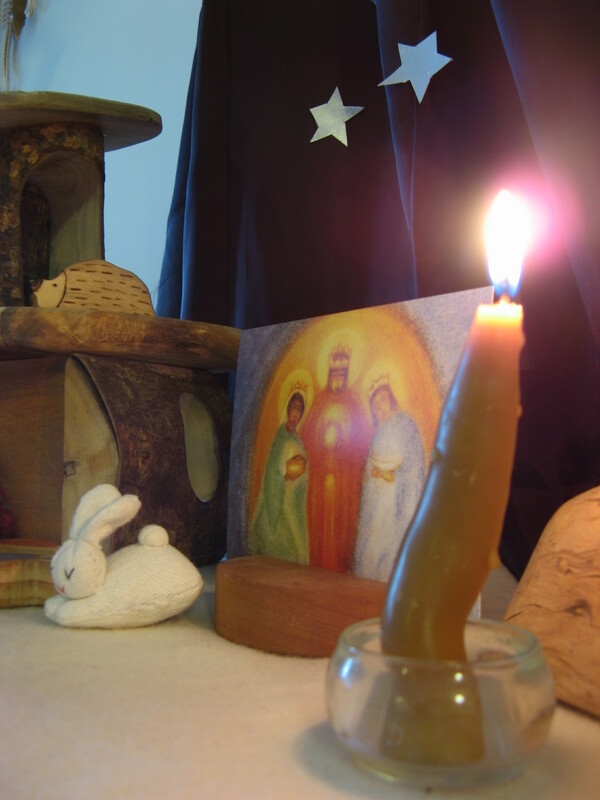 Don’t feel restricted by only making straight candles. When using a smallish pot we experimented by gently bending the wick in a spiral when first dipping. It worked just fine. 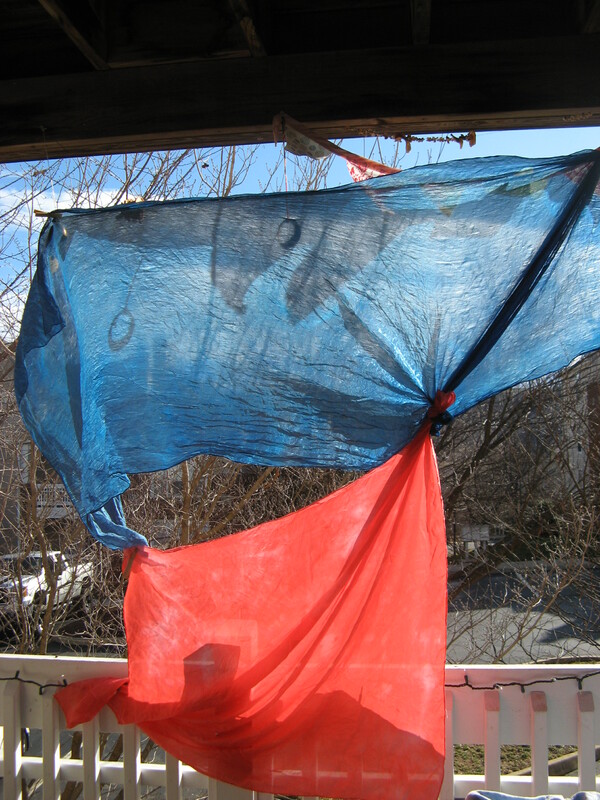 * As a side note…for a winter activity we ended up using a gloriously sunny January morning. It was so hot outside that we had to make our own shade. Crazy huh! Love this! I have faint memories of making a multi-colored lop-sided candle in preschool and I have often thought about doing this with my preschoolers…now I know where to start, thanks! Yes, our candles were pretty lopsided too. All part of the charm though! I am pleased you are enjoying the blog. I dip candles with children nearly every week at the museum where I work. I love the ease of your clothespins for holding the wick, but if you do want to try for straighter candles, try tying the wick to the middle of a 8 or 9 inch long stick and having the children hold both ends of the stick while they lower the wick into the pot. It creates a more stable dip and an even coat. amazing but doesn’t the wooden clothes pin catch fire? 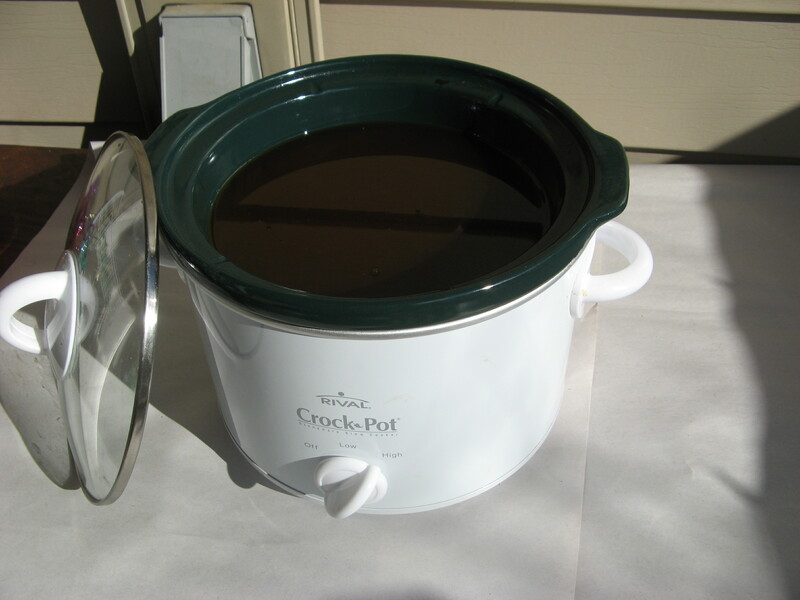 Hi, do you know the depth of your crock pot? I have wicks cut at 9 inches and am hoping to find a crock pot that will fit them.